L.A. private eye Phillip Marlowe takes on a blackmail case — ¦and a trail peopled with murderers, ponrographers, nightclub rogues, the spoiled rich and more. Humphrey Boart plays Raymond Chandlers’ legendary gumshoe and director Howard Hawkes serves up snappy character encounters (particularly involving Lauren Bacall), brisk pace and atmosphere galore in the certified classic. Philip Marlowe (Humphrey Bogart): Well, I, uh, I try to be. Philip Marlowe (Humphrey Bogart): Yeah, wasn’t it. By the way, how’d you happen to have one? Philip Marlowe (Humphrey Bogart): I could make it my business. Philip Marlowe (Humphrey Bogart): Oh, you wouldn’t like it. The pay’s too small. Philip Marlowe (Humphrey Bogart): Not particularly. Philip Marlowe (Humphrey Bogart): Oh, Eddie, you don’t have anybody watching me, do you? Tailing me in a gray Plymouth coupe, maybe? Philip Marlowe (Humphrey Bogart): Well, I can’t imagine, unless you’re worried about where I am all the time. Vivian Rutledge (Lauren Bacall): How did you find her? Philip Marlowe (Humphrey Bogart): I didn’t find her. Philip Marlowe (Humphrey Bogart): I haven’t been here, you haven’t seen me, and she hasn’t been out of the house all evening. Vivian Rutledge (Lauren Bacall): So you do get up, I was beginning to think you worked in bed like Marcel Proust. Philip Marlowe (Humphrey Bogart): Who’s he? Vivian Rutledge (Lauren Bacall): You wouldn’t know him, a French writer. Philip Marlowe (Humphrey Bogart): Come into my boudoir. Vivian Rutledge (Lauren Bacall): Speaking of horses, I like to play them myself. But I like to see them workout a little first, see if they’re front runners or comefrom behind, find out what their whole card is, what makes them run. Philip Marlowe (Humphrey Bogart): Find out mine? Vivian Rutledge (Lauren Bacall): I think so. Philip Marlowe (Humphrey Bogart): Go ahead. Vivian Rutledge (Lauren Bacall): I’d say you don’t like to be rated. You like to get out in front, open up a little lead, take a little breather in the backstretch, and then come home free. Philip Marlowe (Humphrey Bogart): You don’t like to be rated yourself. Vivian Rutledge (Lauren Bacall): I haven’t met anyone yet that can do it. Any suggestions? Philip Marlowe (Humphrey Bogart): Well, I can’t tell till I’ve seen you over a distance of ground. You’ve got a touch of class, but I don’t know how, how far you can go. Vivian Rutledge (Lauren Bacall): A lot depends on who’s in the saddle. Vivian Rutledge (Lauren Bacall): You go too far, Marlowe. Philip Marlowe (Humphrey Bogart): Those are harsh words to throw at a man, especially when he’s walking out of your bedroom. Philip Marlowe (Humphrey Bogart): You know what he’ll do when he comes back? Beat my teeth out, then kick me in the stomach for mumbling. Vivian Rutledge (Lauren Bacall): You’ve forgotten one thing —  me. Philip Marlowe (Humphrey Bogart): What’s wrong with you? Vivian Rutledge (Lauren Bacall): Nothing you can’t fix. Philip Marlowe (Humphrey Bogart): In a glass. Vivian Rutledge (Lauren Bacall): I liked that. I’d like more. Philip Marlowe (Humphrey Bogart): She tried to sit in my lap while I was standing up. Vivian Rutledge (Lauren Bacall): I don’t like your manners. Philip Marlowe (Humphrey Bogart): And I’m not crazy about yours. I didn’t ask to see you. I don’t mind if you don’t like my manners, I don’t like them myself. They are pretty bad. I grieve over them on long winter evenings. I don’t mind your ritzing me drinking your lunch out of a bottle. But don’t waste your time trying to cross-examine me. Philip Marlowe (Humphrey Bogart): My, my, my! Such a lot of guns around town and so few brains! You know, you’re the second guy I’ve met today that seems to think a gat in the hand means the world by the tail. Vivian Rutledge (Lauren Bacall): Why did you have to go on? Philip Marlowe (Humphrey Bogart): Too many people told me to stop. Vivian Rutledge (Lauren Bacall): So you’re a private detective. I didn’t know they existed, except in books, or else they were greasy little men snooping around hotel corridors. My, you’re a mess, aren’t you? Philip Marlowe (Humphrey Bogart): You made a mistake. Mrs. Rutledge didn’t want to see me. Philip Marlowe (Humphrey Bogart): Hmm. Philip Marlowe (Humphrey Bogart): It means, hmm. Philip Marlowe (Humphrey Bogart): Yes, in the old days, when he used to run rum out of Mexico and I was on the other side. We used to swap shots between drinks, or drinks between shots, whichever you like. Philip Marlowe (Humphrey Bogart): I know he was a good man at whatever he did. No one was more pleased than I when I heard you had taken him on as your — ¦ whatever he was. Philip Marlowe (Humphrey Bogart): Thanks for the drink, General. Philip Marlowe (Humphrey Bogart): No, just having fun trying to guess what they are. Vivian Rutledge (Lauren Bacall): Do you always think you can handle people like, uh, trained seals? Philip Marlowe (Humphrey Bogart): Uh-huh. I usually get away with it too. Vivian Rutledge (Lauren Bacall): How nice for you. Philip Marlowe (Humphrey Bogart): You do sell books, hmm? Philip Marlowe (Humphrey Bogart): Well, from here they look like books. Philip Marlowe (Humphrey Bogart): I can do what? Where? Oh no, I wouldn’t like that. Neither would my daughter. Philip Marlowe (Humphrey Bogart): I hope the sergeant never traces that call. Philip Marlowe (Humphrey Bogart): You wanna tell me now? Vivian Rutledge (Lauren Bacall): Tell you what? Philip Marlowe (Humphrey Bogart): What it is you’re trying to find out. You know, it’s a funny thing. You’re trying to find out what your father hired me to find out, and I’m trying to find out why you want to find out. Vivian Rutledge (Lauren Bacall): You could go on forever, couldn’t you? Anyway it’ll give us something to talk about next time we meet. Philip Marlowe (Humphrey Bogart): Among other things. Philip Marlowe (Humphrey Bogart): Day and night? Philip Marlowe (Humphrey Bogart): Oh, that’s too bad. You got a better one? Philip Marlowe (Humphrey Bogart): Did I hurt you much, sugar? Philip Marlowe (Humphrey Bogart): How’d you happen to pick out this place? Vivian Rutledge (Lauren Bacall): Maybe I wanted to hold your hand. Philip Marlowe (Humphrey Bogart): Oh, that can be arranged. Philip Marlowe (Humphrey Bogart): You the guy that’s been tailing me? Philip Marlowe (Humphrey Bogart): Swell. Did you want to see those guys jump me? Philip Marlowe (Humphrey Bogart): You could’ve yelled for help. Philip Marlowe (Humphrey Bogart): Yeah, yeah, he’s here. Philip Marlowe (Humphrey Bogart): He can’t talk to you. Philip Marlowe (Humphrey Bogart): Because he’s dead. Philip Marlowe (Humphrey Bogart): Hey, your kind always does. Lash Canino: What’s the matter? Haven’t you ever seen a gun before? What do you want me to do, count three like they do in the movies? Philip Marlowe (Humphrey Bogart): Let me do the talking, angel. I don’t know yet what I’m going to tell them. It’ll be pretty close to the truth. Philip Marlowe (Humphrey Bogart): I’m getting cuter every minute. Philip Marlowe (Humphrey Bogart): Nobody is. Philip Marlowe (Humphrey Bogart): Somebody’s always giving me guns. Philip Marlowe (Humphrey Bogart): I’m not very tall either. Next time I’ll come on stilts wear a white tie and carry a tennis racket. Vivian Rutledge (Lauren Bacall): I doubt if even that will help. Vivian Rutledge (Lauren Bacall): What will your first step be? Philip Marlowe (Humphrey Bogart): The usual one. Vivian Rutledge (Lauren Bacall): I didn’t know there was a usual one. Philip Marlowe (Humphrey Bogart): Well sure there is, it comes complete with diagrams on page 47 of how to be a detective in 10 easy lessons correspondent school textbook and uh, your father offered me a drink. Vivian Rutledge (Lauren Bacall): You must’ve read another one on how to be a comedian. Philip Marlowe (Humphrey Bogart): I collect blondes and bottles too. Philip Marlowe (Humphrey Bogart): Yeah, what you see’s nothing, I got a Balinese dancing girl tattooed across my chest. Philip Marlowe (Humphrey Bogart): Get up angel, you look like a Pekingese. Philip Marlowe (Humphrey Bogart): [speaking into the phone] Hello, let me talk to Mr. Mars. Eddie Mars: This is Mars. Philip Marlowe (Humphrey Bogart): Oh, hello Eddie. This is Marlowe. Philip Marlowe (Humphrey Bogart): Yeah, Marlowe. Or, what’s left of him. Philip Marlowe (Humphrey Bogart): [speaking into the phone] Bernie? This is Marlowe. I got some more red points for you. Chief Inspector Bernie Ohls: Who is it this time? While working on the script, writers William Faulkner and Leigh Brackett couldn’t figure out from the novel who murdered a particular character. So they phoned Raymond Chandler, who angrily told them the answer was right there in the book. They shrugged and returned to their work. Chandler soon phoned to say that he looked at the book himself and couldn’t figure out who killed the character, so he left it up to them to decide. In the original cut, shown to the armed services, this question is resolved; in the film as released, it isn’t. The scene where Humphrey Bogart and Lauren Bacall make suggestive talk about horses was added almost a year after filming was otherwise complete, in an attempt to inject the film with the kind of risque innuendos that had made To Have and Have Not (1944), and Bacall, so popular a few years earlier. Mars’ henchman are named Sidney and Pete, a tribute to Bogie’s frequent co-stars Sydney Greenstreet and Peter Lorre. Eager to repeat the success of To Have and Have Not (1944), Warner Bros. studio chief Jack L. Warner gave Howard Hawks $50,000 to purchase the rights for The Big Sleep. Hawks bought the rights for $5,000 and pocketed the rest. Due to Humphrey Bogart’s affair with co-star Lauren Bacall, his marital problems escalated during filming, and his drinking often resulted in his being unable to work. 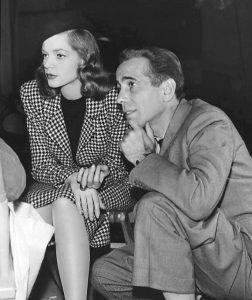 Three months after the film was finished, Bacall and Bogart were married. Raymond Chandler claimed that Martha Vickers gave such an intense performance as Carmen Sternwood that she completely overshadowed Lauren Bacall, and that much of Vickers’ performance ended up on the cutting room floor as a result. References are made by both sisters about Marlowe’s height at the beginning of the film. Back then it was film convention for the male lead to be taller than the female and Humphrey Bogart was shorter than both leading actresses, a problem corrected on screen through giving Bogart platform shoes as well as trick photography. Rumors that Andy Williams dubbed Lauren Bacall’s singing voice are untrue. Both director Howard Hawks and Bacall confirm that she did her own singing. The fussy persona that Marlowe adopts upon arriving in Geiger’s bookstore has been a subject of argument for years; Lauren Bacall said that Humphrey Bogart came up with it while Howard Hawks claimed in interviews that it was his idea. What both of them failed to notice is that it was in the original book ( — I had my horn-rimmed glasses on. I put my voice high and let a bird twitter in it. — ); all Bogart did was elaborate on it. Many of the cars in the film have a — B —  sticker in the lower-right corner of their windshields. This is a reflection of the wartime rationing of gasoline. Gas was rationed primarily to save rubber, because Japan had occupied Indochina, Malaysia, and Indonesia. (There was a shortage of gas on the East Coast until a pipeline from Texas was constructed to replace the transport of crude oil by sea.) The B sticker was the second lowest category, entitling the holder to only 8 gallons of gas a week. Marlowe seems to use more than one week’s allotment during a 72-hour period, which may be intended to reflect a black market in ration books. However, since Marlowe still has a deputy badge, at least in a deleted scene which existed in the 1945 version, he would be entitled to an X sticker (unlimited gas) as a peace officer. Perhaps the B sticker on the windshield was camouflage, since an X sticker would make the car extremely noteworthy. Marlowe also refers to — three red points, —  and speaks of a dead body as — cold meat —  which refers to the red tokens used to acquire a family’s allotment of meat during WWII. This was the first film to mark the long relationship between Howard Hawks and writer Leigh Brackett until his death in 1977. Hawks hired her after reading a story that she wrote entitled — No Good for a Corpse’. But then, when she was hired, she only finished half of another story that she wrote titled — Lorelei of the Red Mist’. Her friend, Ray Bradbury finished the last half. William Faulkner came out to Hollywood to work on this film, but found that being around the set didn’t agree with him, so he asked Howard Hawks if he could work — from home. —  Hawks agreed, assuming that Faulkner meant from his Hollywood apartment. Instead, Faulkner returned to his home in Oxford, Mississippi, leaving Hawks rather unhappy. Charles Waldron’s (Gen Sternwood) last film. He died before the film premiered. However, he appeared in three other 1946 releases that, despite opening earlier in the year than The Big Sleep, were shot subsequently. James Stewart recreated the role in the 1978 remake in one of his last roles. Coincidentally, Waldron had played Stewart’s father in Navy Blue and Gold (1937). 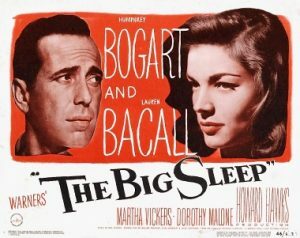 Production date for The Big Sleep was Oct. 10, 1944 through Jan. 12, 1945. Additional scenes/retakes were shot beginning Jan. 2, 1946. The bulk of the film was shot during wartime. The second of four films made by real life couple and later husband and wife Humphrey Bogart and Lauren Bacall. This film follows Bacall’s debut in To Have and Have Not (1944), during which their romance was first kindled on set. Following this film, the couple teamed up twice more, for Dark Passage (1947) and Key Largo (1948). SPOILER: Howard Hawks reused the way Eddie Mars meets his demise (shot by his own men after opening a door) with that of the character Milt in Hawks’ later western El Dorado (1966).